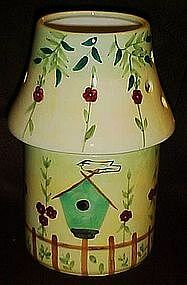 Large candle lamp is made of glazed ceramic and is hand painted with a garden scene and has birds and bird houses. 2 pieces. Shade has large holes that emit light when candle is lit. Measures 9 3/8" tall. No chips or cracks. Very sweet. Will hold very large pillar candles or smaller.